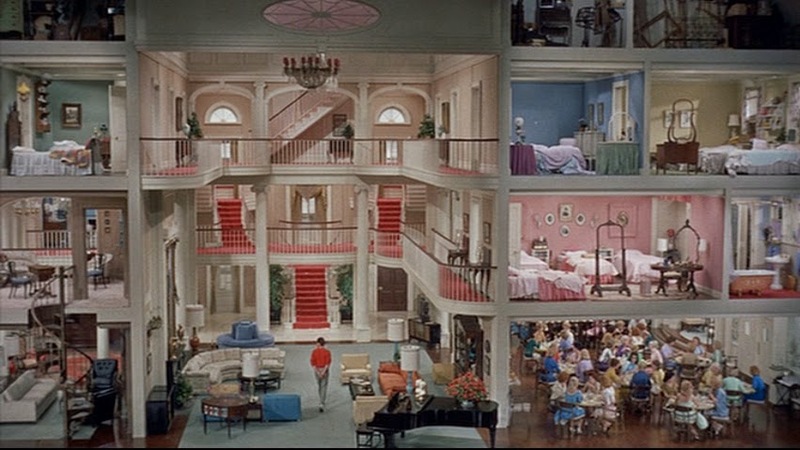 When discussing Jerry Lewis’s The Ladies Man, you almost have to get the dollhouse set out of the way before getting to anything else. It is quite a sight, both for its expanse - it took up two stages of the Paramount lot, and it shows - and its versatility. The film is about a recent college grad who, in an effort to get over the girl who broke his heart, swears off women forever, a pronouncement instantly challenged by his first job - handyman and caretaker at a women’s boarding house. Every wall in the house seems movable, as the action moves from space to space, an effect that at once gives us the opportunity to explore while challenging our sense of spatial relation in a way Kubrick would nearly twenty years later in The Shining. Lewis seems to at once use this shot as a point of pride - “look at what we built!” - and a method of constraint - “That’s all there is!” The entire rest of the film will play out in this seemingly-sealed world. But Lewis isn’t exactly one to play by the rules. Just because he’s established a space doesn’t mean he can’t challenge himself. Most of the action is comprised of a series of sketches jumping off from the basic outline (though, thankfully, the sexual repression angle is more an undercurrent than a constant motivator). The longest of these involves a television program visiting the house and interviewing its owner, former opera star Helen Welenmelon (singer Helen Traubel). Once the TV cameras move in, the set (or at least our conception of it) expands, past the point of “reality,” showing the point at which the hardwood floor ends and the actual Paramount sound stage ends. 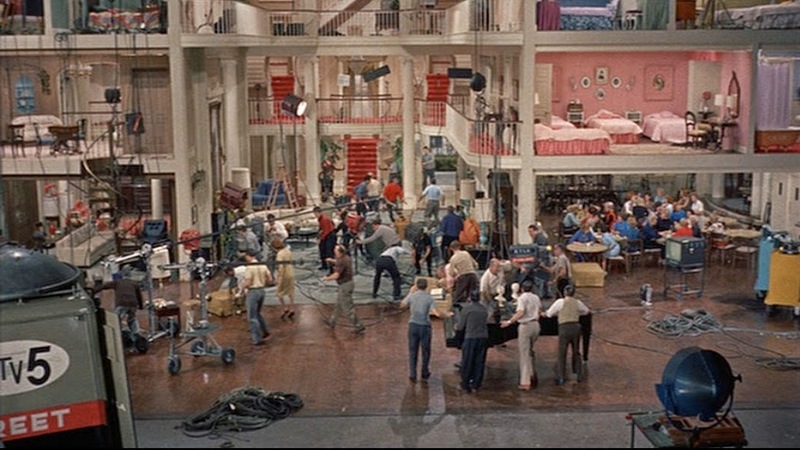 In a more aesthetics-based sense, this explosion of the film’s boundaries makes it perfectly natural to get to the scene’s most surreal portion, when Lewis enters the room from which he has been forbidden, only to find a mysterious world full of big band musicians, oddly-dressed dancers, and a flying wall that reveals a terrace looking out into the sky. Now, Lewis was never one for trying to use the cinema to merely document a representation of what already exists, so this acknowledgement of the pure artifice of his films is hardly uncharacteristic. Rather, this precise method of doing so points to his larger working ethos. When I saw Lewis speak in a two-hour conversation at Cinefamily in early 2013, Executive Director Hadrian Belove pulled out a sign bearing a caricature of Lewis that read, “This is not a closed set. Come on in, you are most welcome.” Lewis seemed surprised to see the sign, and explained that he never understood all the restrictions surrounding movie sets, insisting that he would benefit from having a crowd to play to. With this one simple shot in The Ladies Man, Lewis almost literally breaks down the fourth wall, inviting the audience in to see how movies are made. If you want to see a possible instance of this at play, look to the scene in which frequent Lewis player Kathleen Freeman feeds Lewis baby food (it starts around the 1:19 mark in this video). Throughout the bit, Lewis seems to indicate to a presence just off stage right, looking at them, breaking ever so slightly, and even yelling at them at one point, “This woman is out of her mind!” The whole scene consists of a shot of just the two of them playing off a simple premise, much in the way Lewis would have performed live comedy as he was coming up as an entertainer. A live audience fuels this sort of stuff, letting the actors know which buttons to keep pushing, how long to pause, and how to keep the laughter rolling. The result works as perfectly for the film's audience as it would for those present, never seeming tired or over-rehearsed, nor underdeveloped, all too often a presence in comedy filmmaking. It helps keep the overdetermined sets and camerawork fresh, lived-in, and spontaneous. Each time troubles purchase stern that suggests simply merely entirely "must" have gotten else possessions, having getting some truly Strategy Home fund credit is that the upper vogue relating than equity credit line on the economic center for you. You get what amount of cash need; someone clutch your current machine in conjunction with the larger a locality of U.S.A. primarily encourage this kind payday loan of concern vehicle before aura item can apparently be settled entire, notably where occasion this kind of matter will clearly be invert for yourself expense free in conjunction with obvious. its by and big that direct.